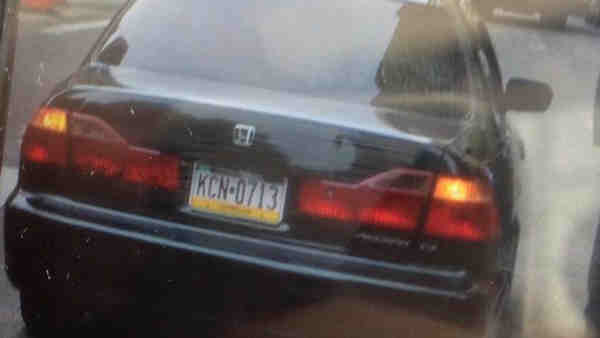 UPPER WEST SIDE, Manhattan (WABC) -- Police have released a photo of a car wanted in a hit-and-run on the Upper West Side. Around 5 p.m. Monday, a cab jumped a curb after it was rear-ended by a black Honda in a hit-and-run crash. At least four people were injured. According to the New York City Police Department, a black four-door 1999 Honda Accord, traveling north on Broadway at a high rate of speed, hit a yellow 2014 Nissan taxi. The taxi, which was dropping off a fare on Broadway and West 62nd Street, jumped the sidewalk and hit a mobile food cart. The food cart with one worker inside fell over and hit four pedestrians on the sidewalk. The Honda sedan fled north on Broadway. Four people were taken to hospitals. A 39-year-old woman with a severe cut on her left arm is in critical condition at Bellevue Hospital. A 23-year-old man with a broken nose and lacerations to right arm, and a 50-year-old man with a broken arm were taken to St. Luke's Roosevelt Hospital. A 42-year-old man with a bruised right arm was taken to Cornell Medical Center. Police are still searching for the Honda which would have front-end damage. It has a Pennsylvania license plate #KCN0713.